Casper and Tuft and Needle are two of the most popular factory direct mattress start-ups online. They are both shaking things up in a big way with their direct-to-consumer model. No more fancy stores with rows of beds, no more beds with remote controls, but most importantly, no more mattress middle men. So who will win, Casper or Tuft and Needle Mattress? Read on for our head-to-head Casper vs. Tuft & Needle review. The Tuft & Needle and Casper have both taken differing approaches to their foam construction. Casper is a hybrid foam mattress. It’s 9.5″ thick and built from 4 different foam layers. Top layer – the top layer is 1.5″ of responsive poly foam. This top layer is responsible for the comfort, cooling, and bounce for the mattress. Second layer – the second layer is 1.5″ of memory foam. 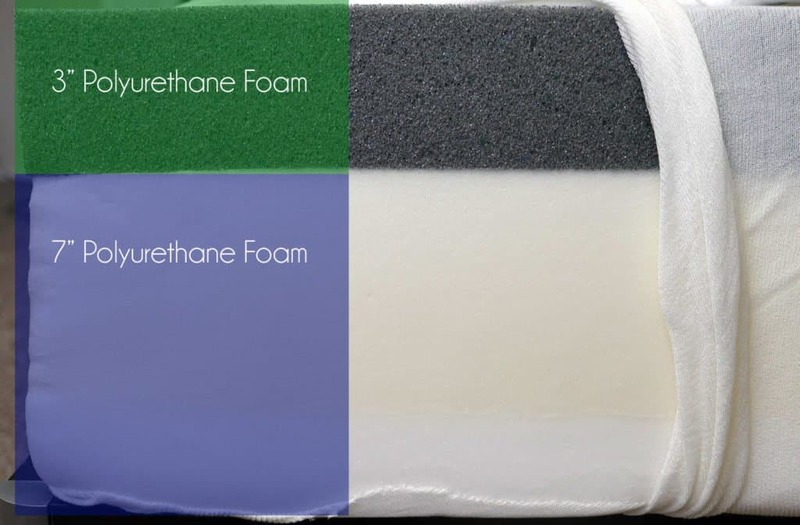 This foam has a density of 4.0 PCF (pounds per cubic foot). Having the memory foam layer below the responsive poly foam helps to reduce the chance of heat retention issues. Additionally, memory foam also helps to improve contour and pressure relief for the sleeper. Third layer – the third layer is 1.5″ of poly foam. The foam has a density of 2.5 PCF. It’s somewhat like the base foam, but slightly softer and helps to act as a transitional support layer so the support wall into the base foam isn’t so abrupt. Bottom layer – the bottom layer is a 5″ support foam. This layer acts as the foundational base for the mattress and provides support for sleepers. 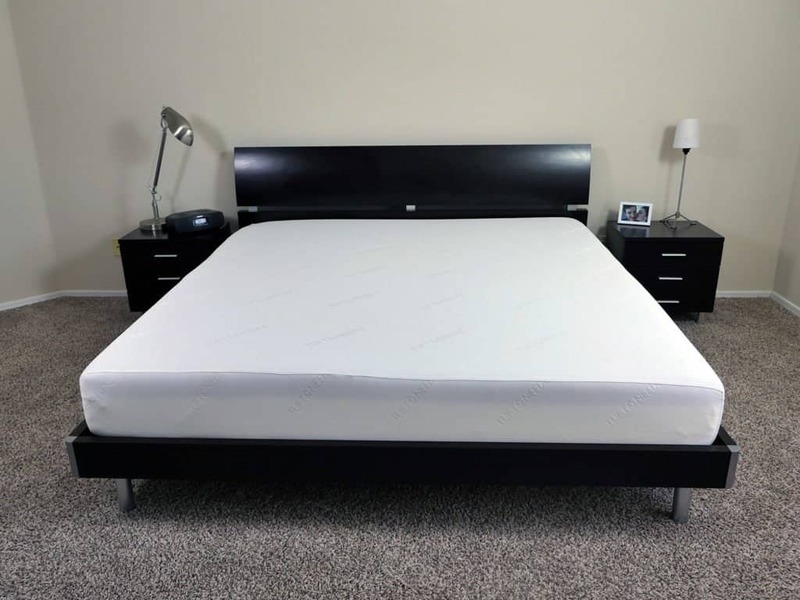 This type of a hybrid mattress is aimed at getting the best of both worlds of responsive poly foam and memory foam. 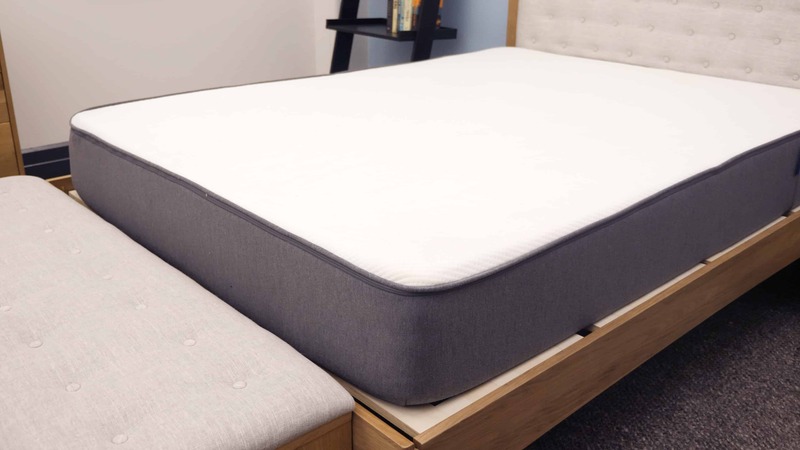 Having the poly foam layer on top helps the Casper mattress sleep cooler, while still being highly supportive and providing good pressure relief from the memory foam layer. One brief note about the Casper foam layer densities. 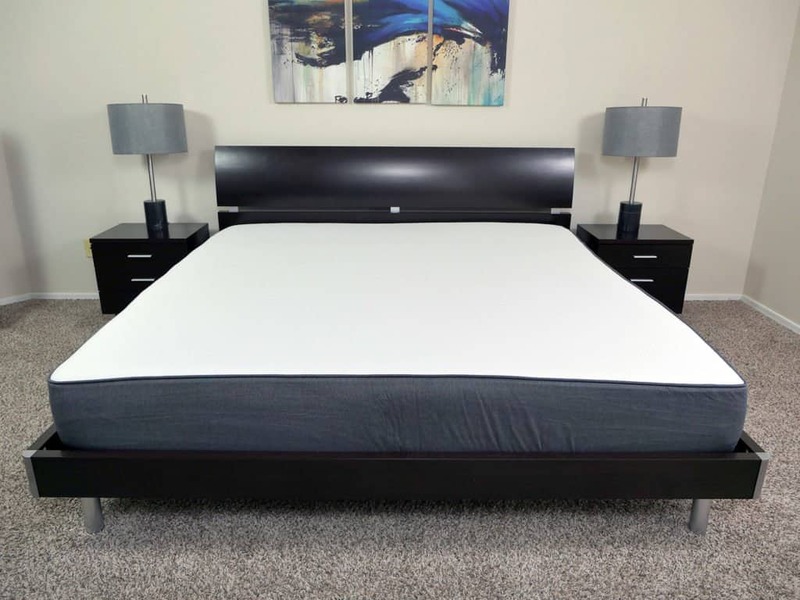 The density of the memory foam, transition poly foam, and support poly foam were previously listed on Casper.com. But, they have been removed from their original locations and I cannot find a reference to them elsewhere on Casper.com now. The Tuft & Needle’s construction is more minimized. Tuft and Needle only uses 2 foam layers. Top layer – the top layer acts as the comfort layer. It is a 3″ thick poly foam custom developed by Tuft and Needle. It has a density of 2.9 PCF. It’s designed to breathe well, while also being responsive. Bottom layer – the bottom layer of the Tuft and Needle is a 7″ layer of poly foam. It has a density of 1.8 PCF. It provides much of the support for sleepers, while also acting as the foundational base for the mattress. Tuft & Needle is pretty secretive about what’s actually in their top layer of foam. However, based on my experience testing and seeing other similar foams I believe it is a standard poly foam (non-visco elastic) that has been mixed with graphite. The graphite’s objective is to help further reduce heat retention. However, it has an added side effect of changing the comfort dynamic (see more below). Please bear in mind that Tuft and Needle has not confirmed that their foam uses graphite. This is merely my opinion and is speculative based on my experience with other similar foams. What is confirmed is that the primary material of the top layer of foam is 100% polyurethane (non-visco elastic). Both the Casper & Tuft & Needle have fairly similar covers. Both covers are simple, mostly white, a bit stretchy, and have a nice feel. Both are thin and soft. From a functionality standpoint, the thinness of the cover is the most important factor. Having a thin cover helps to facilitate airflow in the mattress. While this is a nice feature for both covers, neither cover is substantially better or worse than the other, with respect to breathability from the cover. Unfortunately, the thinnest of the covers is a bit of a double edged sword. While it’s great for cooling, it also does make them slightly more susceptible to damage. If you do buy a Casper or Tuft and Needle you’ll want to be very careful when moving them. One aesthetic note regarding Tuft and Needle’s cover. It is so thin you are able to see the foam materials through the cover. If your sheets are also very thin this could mean that you could see the foams through them as well. It’s more of a style issue, but something to bear in mind. Comparing firmness, both the Tuft and Needle and Casper are very similar. I would rate the Tuft & Needle at a 6-6.5 out of 10 on the firmness scale (where 10 is the firmest), whereas the Casper is a 6-7 out of 10. The firmness range on both of these mattresses is the result of the relatively thin comfort layers that both mattresses use. 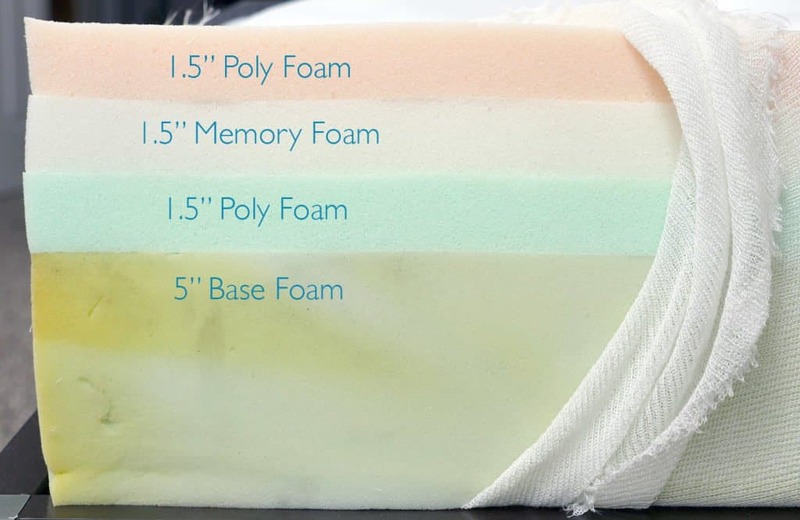 Having only 3″ of comfort foam on top means heavier sleepers can sink through these foam layers into the firmer and less comfortable base and transition poly foams. As a result, heavier sleepers may find each of these mattresses firmer and less supportive. Despite their relative similarity in firmness, the feel of each mattress is quite different. Casper’s softness translates through a more pronounced “hug” like feeling. When you lie into the Casper you’ll feel a bit more sinkage as the poly foam and memory foam layers conform to your body. The 2nd layer of memory foam means you get a nice contour and pressure relief, especially the longer you lie on the Casper. Additionally, having a responsive poly foam on top means better cooling, bounce, and response. My only complaint with the Casper is the top layers aren’t thick enough, forcing sleepers to engage the poly foam transition and base layers more deeply. For a complete deep dive into the feel, comfort, and support dynamics of the Casper please read my full Casper mattress review. The Tuft & Needle on the other hand is a bit more of a floating feel. There is some sinkage, but it’s not as notable. Additionally, the feel of the Tuft and Needle is sort of stuck in the middle of a latex and a memory foam. It’s not visco elastic, so you don’t get the same type of memory foam hug and contour. But it’s also not quite latex, so you don’t get the same bounce and response there either. FAQ: How to choose a mattress? Personally, I don’t really like the feel of the new Tuft and Needle foam. Over the course of the last couple of years they’ve made major changes to their foam and mattress design. The newest iteration of the foam and mattress just feels a bit dead. 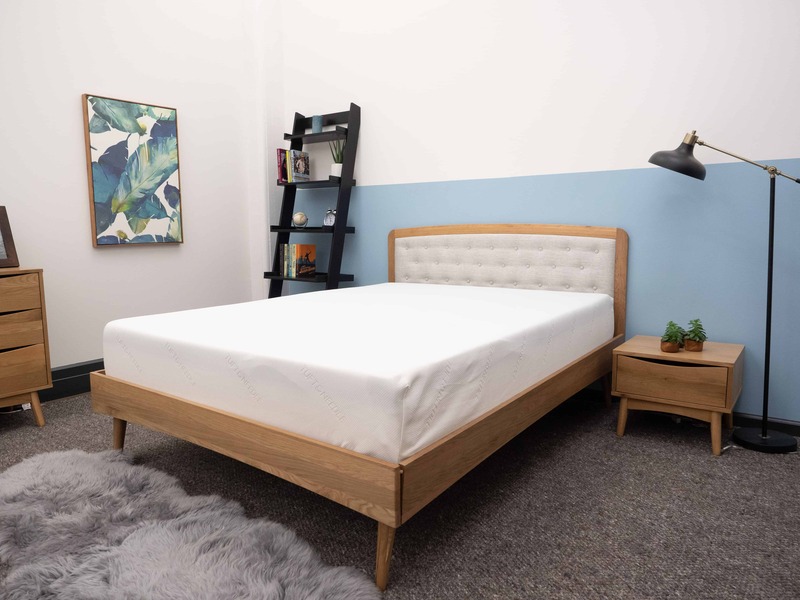 For a complete deep dive into the feel, comfort, and support dynamics of the Tuft & Needle please read my full Tuft and Needle mattress review. Sometimes the best way to decide the right option is to simply lay out all the cards on the table and see what’s most important to you. Both Casper and Tuft & Needle are great mattresses, but your specific needs, priorities, and preferences will vary, likely making one a little bit better. Below is a complete list of all the major comparison points of Casper vs. Tuft & Needle. Should you buy a Casper or Tuft & Needle? The mattress that’s right for you ultimately hinges on your sleep preferences and priorities. The biggest differentiating factors between Casper and Tuft & Needle are the ones that will likely determine which mattress is the better choice for you. I have listed those critical decision points below. You prefer a medium to slightly firm feel – Casper is a 6-7 out of 10 on the firmness scale (where 10 is the most firm). Heavier sleepers may find it closer to that 7’ish firmness, while lighter sleepers should find it closer to a 6. You prefer a mattress that hugs you – Casper’s softer feel gives it a more pronounced hug and sinkage. This allows the mattress to better contour to your body to provide support, softness, and a nice feel. Click here to Shop for the Casper. You prefer a medium to medium firm feel – Tuft & Needle is a 6-6.5 out of 10 on the firmness scale (where 10 is the most firm). Just as with Casper, heavier sleepers may find it closer to that 6.5’ish firmness, while lighter sleepers should find it closer to a 6. You prefer less hug – while the Tuft and Needle does have some sinkage, it is less than Casper (and many others). The foams Tuft and Needle uses are not visco elastic, so they don’t hug / contour the same way memory foam will. This results in a little more of a floating feel and less hug. You want the best deal – while price isn’t the only factor you should consider, it’s hard to beat the Tuft and Needle on price. $750 for a Queen is a pretty good deal. 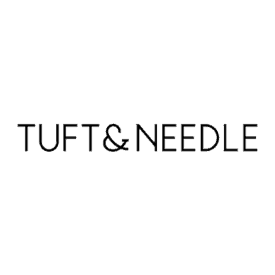 Click here to Shop for the Tuft & Needle. Very helpful. Thanks for comparing the 2 mattresses for me. Great job.